Yesterday I wrote about my preference for since or because over as in sentences where these words are synonymous. I have since been reminded of an even worse option: seeing as how. How I’d love to say that “seeing as how” is incorrect. I can’t because I have no authority to point to, and it is, unfortunately, an expression in increasingly common use (See the graph below on its use in print publications). Who am I to say that the many who use it are wrong about it? What I can say is it’s an ugly, awkward expression with several preferable alternatives. It’s not wrong; I just don’t like it. Seeing as I have a headache, I won’t be going to work today. Seeing that I have a headache, I wont’ be going to work today. Either since or because would be, in my opinion, a strong improvement — perfectly clear and more concise. Since I have a headache, I won’t be going to work today. Because I have a headache, I won’t be going to work today. For this sentence, however, I prefer either of these options: inasmuch as or insofar as. Both carry the the same meaning as “since” but can also mean “to the extent or degree that” — a slight variation that works in this case. Inasmuch as I have a headache, I won’t be going to work today. Insofar as I have a headache, I won’t be going to work today. The variety and flexibility of English is both a curse and a blessing for the writer. We have listed here seven alternatives to what I consider a hideous construction — seeing as how. Each is a synonym of the other and could be used acceptably in this sentence. And there are other options, though none preferable: due to the fact that, because of the fact that, for the reason that, even considering that or in light of the fact that. All of these are unnecessarily wordy phrases, but all common in print and daily speech. When it comes to synonymous words and phrases, the writer’s duty is to know the options, consider them carefully, and make a selection. Definition, including both denotation and connotation, should play the primary role in the decision, but aesthetic considerations like rhythm or fluency — the sound of the words — should be considered as well. The composition’s purpose and audience matter as well, of course. 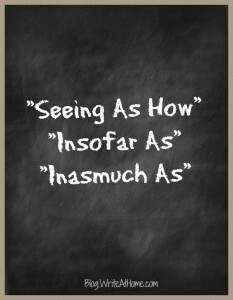 Words like inasmuch might not be appropriate in an informal context, for example. In the end, however, it comes down to subjective personal preference.We choose the expressions we like best. Real writers care about word choices like this, even though it seems rather insignificant in the long run. I’d appreciate your input. Feel free to leave any comments or questions in the space below. You’re From Scotland? Do You Know Phil? “I have a headache and am taking a PTO day” does it for me. So, what about ‘seeing how’? This sounds like a reasonable alternative to me, but I’m no native speaker. It’s fairly common. People use it. I just don’t prefer it. There are other options that sound nicer and clearer to me. It’s purely subjective, however. “Given that I have a headache…”? Sounds a bit like a mathematical assumption. I think Shakespeare was using “Seeing” literally as the present participle of the verb “To see”, i.e. when men will see that death will come when it will come, i.e. when men will when their death will come… and not as a compound preposition. i can’t edit??? I meant “when men will SEE when their death will come” or even simpler “when men will see their death coming”. The three-day battle of Gettysburg (Pennsylvania) is considered by most historians to have been the turning point of the American Civil War seeing as how this was the farthest north that Confederate troops ever reached. I have read your column twice, studied your arguments thoroughly, and have come to the belief that, sorry, you badly miss the mark on this point. None of your suggested alternatives carry the same feeling as “seeing as how.” “Since” and “because” are too abrupt and both “insofar” and “inasmuch” strike me as laughably, not to mention offensively, pedantic. The substitute you offer that I find comes closest to being acceptable is the simpler “seeing as,” but even that lacks the friendly feeling that “seeing as how” conveys. I should point out that my Gettysburg segment above is not part of, say, a formal paper written for a university. Maybe “seeing as how” is a regionalism and, as such, is pleasing to my ear while nails on the chalkboard to yours. You say you just don’t like it. I’m fine with that. I simply happen to like it a lot. This is how I speak. To each his own. Thanks for sharing your perspective, Chris. I appreciate your exploration of the phrase, Brian, but I have to agree with Pablo, at least half way. I think that “seeing as how” certainly has a place, albeit colloquially, in many situations, but “since” is not at all a good alternative. I would argue that when one says “seeing as how”, one is actually meaning to say “in consideration of”, or maybe “because of the fact”. In this case simply saying because is most straight forward, but I think “seeing as how” conveys that the author has truly given consideration to the topic. In this case “since” is clearly incorrect because, well, since and because are often used incorrectly, as is clearly documented just about everywhere. I haven’t noticed that “since” and “because” are often used incorrectly. I’ll have to look into that. It’s a matter of opinion, of course, but I much prefer the latter of your examples. I agree with your use of “since” instead of “seeing as how” in the examples you gave, but what about when “since” is used in the middle of a sentence? For example, “I would hope not, seeing as how you’re always late” versus “I would hope not, since you’re always late”. There’s something about the first one that just sounds better to me. I can’t figure out why, though. Is it just me?